Cut wire into 13 equal pieces. Take one piece of precut wire and wire wrap a loop to one radiant ring. Add one bead art. 5328 8mm mocca from the Swarovski crystal assortment to the other end of the wire. Wire wrap a loop to one Swarovski filigree art. 62011. Take one piece of precut wire and wire wrap a loop to the opposite side of filigree art. 62011. Add on one Swarovski bead art. 5328 8mm mocca to the other end of the wire and proceed to wire wrap a loop to a second filigree art. 62011. Repeat this step until you have three filigree components attached to each other. Add on one Swarovski bead art. 5328 8mm mocca to the open end of the wire (off filigree #3). Wire wrap a loop to one radiant ring. Take one piece of precut wire and wire wrap a loop to the opposite side of the radiant ring. Add on one Swarovski bead art. 5328 8mm mocca to the open end of the wire and wire wrap a loop to a second radiant ring. Working off the first radiant ring from Step 2, take one precut wire and wire wrap a loop to the opposite side of the same ring. Add on one Swarovski bead art. 5328 8mm mocca to the open wire and proceed to wire wrap a loop to a new radiant ring. Proceed in this manner five more times. Take one piece of precut wire and wire wrap a loop to the last filigree art. 62011. Add on one Swarovski bead art. 5328 8mm mocca to the open end of the wire. Wire wrap a loop to the bottom of the radiant ring from Step 2. Note: this filigree is the drop bead off the center radiant ring. You may attach the hook closure by performing a wire wrap using the last Swarovski bead art. 5328 8mm mocca. Note: The hook may be attached to either radiant ring dependent on being right or left handed. Cut wire into 13 equal pieces and thread one piece of wire through each of the 13 beads art. 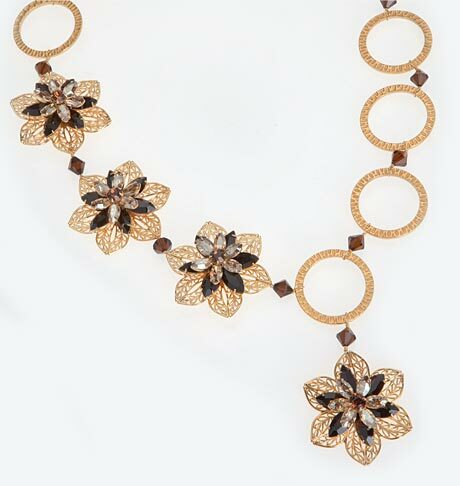 5328 8mm mocca from the Swarovski crystal assortment. Set aside. Center the bead on the wire and wrap the end of the wire through a closed jumpring and back around the top of the wire several times. Cut excess wire. Note: Do not wrap the wire near the part of the jumpring that opens as you will need to open them to assemble the necklace. Repeat for other side of wire and for all remaining beads. Open one of the beaded jumprings and attach it to the gold hook. Connect the other end of the beaded jumpring to one of the TierraCast Gold Radiant Rings. Attach another beaded jumpring to the other end of this Radiant Ring. Connect two more Swarovski filigrees using two more beaded jumprings in the same manner. Add another beaded jumpring to the end of the last filigree added in Step 4. Connect a Radiant Ring to the bottom jumpring on this bead and connect 6 more Radiant Rings in the same manner. Attach the last beaded jumpring to the Radiant Ring that was added after the last filigree in Step 4 (this is the bottom of the necklace). Attach the last Swarovski filigree to the bottom jumpring of this bead.